It seems that in our society people value, respect and appreciate dead artists and their artworks more than the live ones. For example, they could have a new genius in front of them, but they are unlikely to recognize it. They can’t judge artwork for themselves, with their eyes, heart and mind. They only see it as good if it’s featured as such in a newspaper, TV, or presented in a well-known galleries and museums. For some reason people believe that an expensive piece of art is much better than one you can buy for less. So the more expensive it is, the better it is. Of course historical art pieces are more expensive than recent ones, especially from young not established artists, but does this really mean they are actually better or more important? This series called ‘Training’ represents the famous past which here becomes the original present by being interpreted in a new way. This series was born in February 2013 and it was completed in November 2014. Charcoal and acrylics on canvas with wooden colored frame. 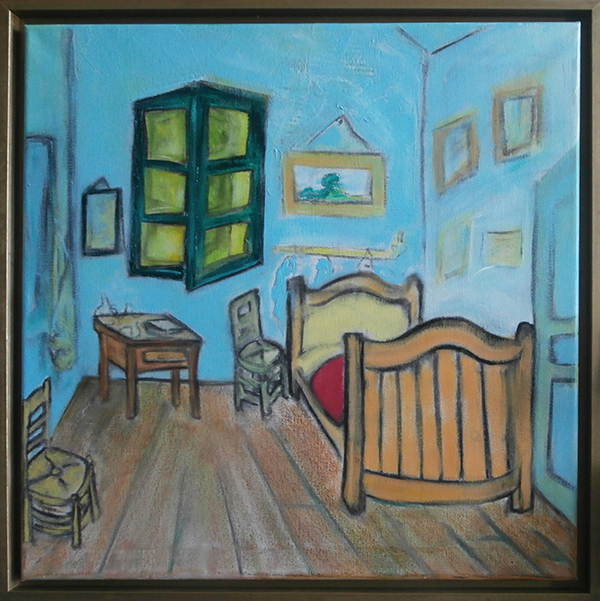 This piece is an original copy of Vincent Van Gogh´s Bedroom in Arles, which was always one of my favorites paintings from art history. For me this art piece is always representing the intimate place of an artist, where he/she is alone with his/her art and life, just feeling and living it honestly; away of society’s judgements and needs of recognitions. Collage painting made by cardboard and paper, glue, charcoal, acrylic colors and varnish on canvas with wooden colored frame. This artwork is inspired by Matisse´s painting Dance made in 1909 with first original title The overpowering climax of luminosity. This artwork makes me believe in peace and love, in power of humanity as something beautiful where we are seeking the realization of the paradise on our earth. Acrylics, charcoal, crayons and varnish on canvas with wooden colored frame. 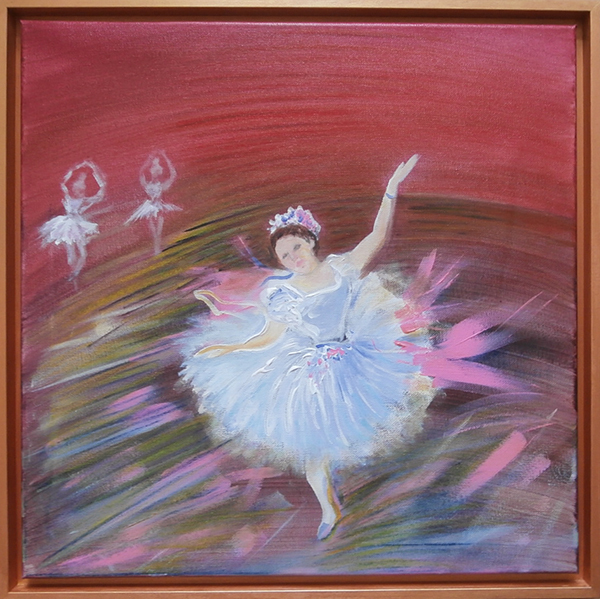 This painting is inspired by great artist of ballerinas – Degas and my daughter Teodora, which frequents ballet school. It is amazing how universal is the beauty of dancing body; of elegant dancing ballerina which is always representing tenderness and at the same time untouchable power of existence. Dance is making art with the body and no other material or instruments are used to express the feeling of life and freedom. Charcoal, acrylic colors, small photo, crayons and varnish on canvas. Painting is framed with wooden colored frame. Title of this artwork with work itself could seem ironical and probably seen as a joke, but it is all actually very serious. It is about contemporary society we live in, where the woman becomes truly powerful and independent comparing with the past. It seems she is the one that can handle everything alone; she can be a business woman and a mother, she can be a powerful politician or famous artist, she is free and powerful as a man if not even more. My version of Leonardo Da Vinci´s Vitruvian Man is modified here according to my creative needs as a contemporary artist. In this case I just had to change the famous man of Leonardo Da Vinci, to a strong contemporary woman. Maybe somehow I am reflecting myself in it, as I am a single mother and young artist in this crazy society of hurry and competition, confronting and resolving all the life problems alone. Acrylic colors, charcoal and varnish on canvas. 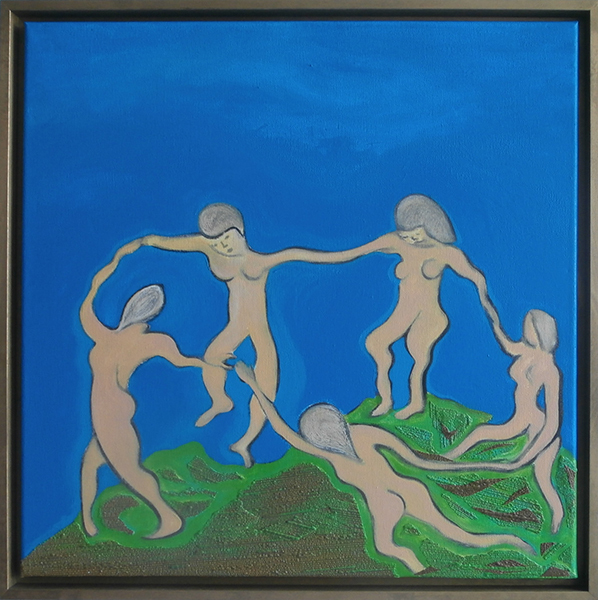 This piece is framed with wooden and colored frame. 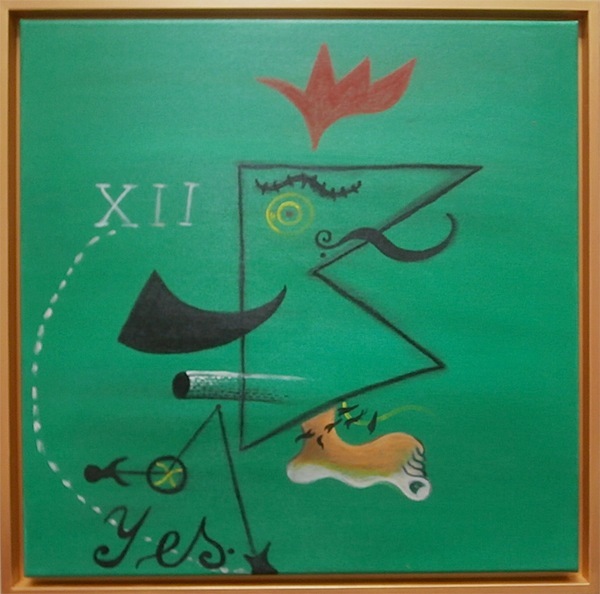 This is an original copy of Joan Miro´s painting from 1924. Charcoal, acrylic colors, mirror and varnish on canvas with wooden colored frame. 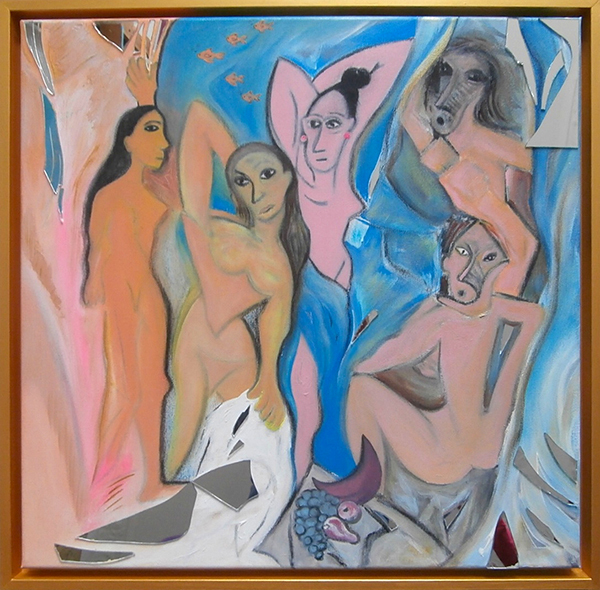 This piece is original copy of famous Picasso´s Les Demoiselles d’Avignon. It is posted here as a simple funny reproduction with added five gold fishes up on the picture and pieces of mirrors glued on canvas for reflecting a spectator in itself. How much do you think you should pay to get a piece of art like this for your collection? Personally I do not see a real big value in this particular piece of art, but I respect a lot the importance of Picasso´s art and life in our art history and I really feel him as our big uncle Pablo. Acrylic colors, oil pastels and varnish on canvas with wooden and colored frame. Rene Magritte is one of my favorites painters. I think his artworks are simply very intelligent. 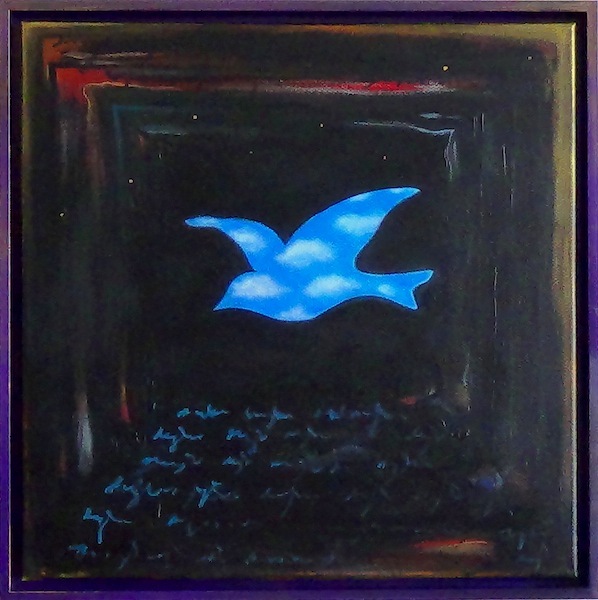 And I used this symbol of bird as a main role playing at my Theater for ever which represents the performance of freedom in my art and in my life. Acrylic colors and glossy transparent varnish on canvas. 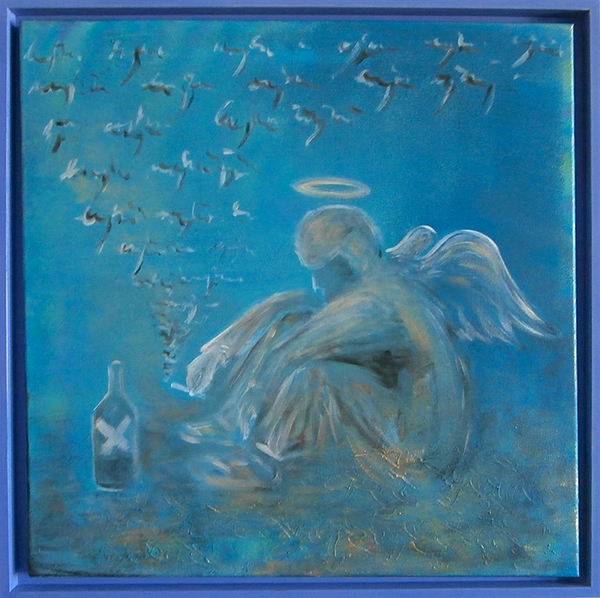 This artwork is an homage to Banksy’s graffiti Angel. Somehow I feel it appropriate to finish this series with this motif, taking my freedom to interpret it in my way. There are many life stories of different true artists that have never survived with doing art because they have never managed to sell it. Just remember Van Gogh for example… However, during my life I recognize that many intelligent and sensitive people in this society start taking drugs or drinking too much alcohol because they have gotten simply bored. Most of the people in this society are like prints and as soon as you are more original than others, you can become alienated if you do not have a talent for something special where people can define and understand your originality, your way of being different. This society we live in is oriented mostly just to work for money and spend to consume. And once you realize, as a part of this society, that on this planet you are working for people which are destroying lives of this planet, you easily become unassociated. The main engine of this society is quite paradoxical and once you recognize your life to be paradoxical, you can get depressed. The only thing, i believe, that can save your life, is love. It can be love for doing art, in case of an artist. It can be love of your family, love for people that can reach your feelings and ideologies… But still, love in our society is not enough to survive, because you need pay the bills, you need to show your work, you need to convince others about your compatibility, you need to be like them. And there is actually no way out from this society, you have no chance to live differently. And you can try to take drugs or drink too much, you can make money illegally, you can try not go to school or to job,… but it is all just an illusion about escaping the society which you actually can not escape. You are part of it and you always will be. So, the only positive solution could be to act and fight with love, but there is still this question to resolve: how to show the sad truth in a positive way? To play with it! ?